It has come to our attention that there are instances of counterfeit EF 50mm f/1.8 II lenses for digital SLR cameras being brought into Canon service centers for repair. These counterfeit products have neither been designed nor manufactured by Canon, yet they fraudulently display the Canon logo and other Canon trademarks, and, as illegal products, they infringe on Canon Inc.'s trademark rights. Canon has taken a strong stance in eradicating these counterfeit products which infringe on the intellectual property rights of our company. 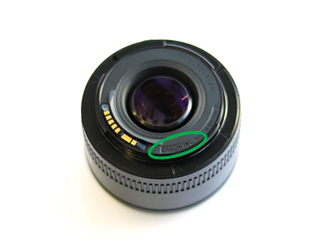 While the exterior of the counterfeit EF 50mm f/1.8 II lens elaborately imitates the exterior of the genuine lens, the parts and electric circuits used inside the counterfeit lens are different from the those used inside the genuine lens. As such, these counterfeit products do not satisfy the safety standards of various countries and the safety / quality standards of Canon. Please note that Canon cannot be held liable for any malfunction, phenomena, damage or injury that occurs due to the use of these counterfeit products, so please exercise caution when making your purchase. There is a space between "CANON" and "INC."
The company name is shown in either printed or molded letters (two types exist). There is no space between "CANON" and "INC."
For more information on counterfeit products please click here.